Save your lesson content to your cloud drives. Drag and drop images and videos effortlessly, reorientate and resize. Throw images, videos and other media from anywhere in class. Transition seamlessly from whiteboard to browser. Enjoy familiar annotation features enhanced by a super-smooth interface. Join tens of thousands of teachers and students who have already discovered the joy of teaching and learning with myViewBoard. Take your whiteboard with you! Simply login via QR code for instant access to your pen presets, personalized canvases and saved lesson content. When you’re done, just logout and leave the ViewBoard digital whiteboard free for the next teacher to use. Captivate your kids by seamlessly weaving digital content into lessons. Create rich lessons directly on the whiteboard. Browse for images or videos, then drag and drop them directly to your canvas. Save lessons to the cloud or share them with your class. Stick with what you know or give something new a go. 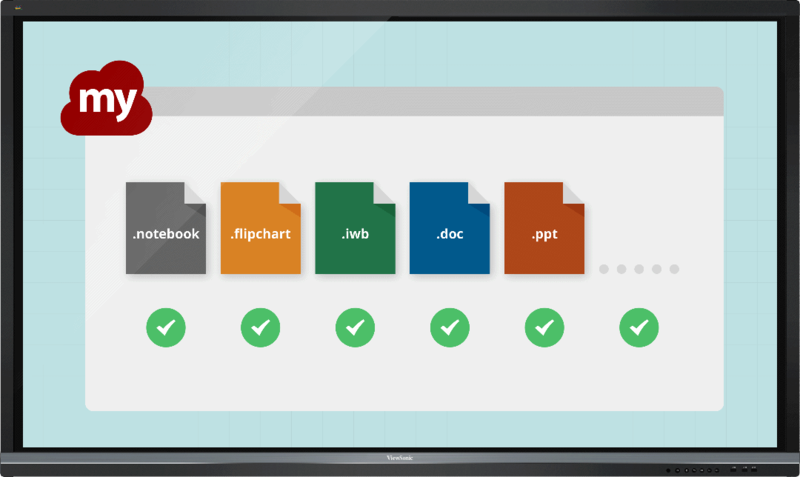 Convert, edit and share existing content saved in .iwb, .notebook, .ppt and .pdf formats. Enliven your lessons by incorporating online content, apps and tools via myViewBoard’s built-in Chrome browser. Make teaching from the front of class a thing of the past. Engage your class by allowing students to share, as well as remotely edit images and canvases in real-time. Give students more attention by controlling and annotating on the ViewBoard from anywhere in class. Save time and make teaching easier with 3 essential tools. Record lessons for students to review the day’s lesson content after class. Render even the messiest of handwriting as easy-to-read text. Turn sketches into Google image searches with an AI-enabled pen tool. Join the digital whiteboard revolution. Sign up for a myViewBoard account and join a global community of tech-enthused educators. Empower your IT team with unrivaled managerial control. Remotely on and off board accounts via a simple intuitive interface that controls accessibility and privileges while monitoring usage data. ViewSonic takes your data privacy and security seriously. Your lesson content and personal data remains securely stored on your cloud drives and is never accessible to the myViewBoard team. Learn more here.